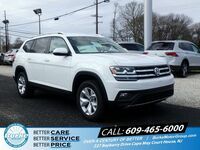 One year can certainly make a difference, and the 2019 Volkswagen Atlas is all the proof you need. While the Atlas made a strong debut for the 2018 model year, this three-row SUV has only improved during the jump to 2019. 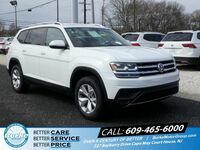 Offered in two new trim levels and coming equipped with even more exciting features than previous models, the 2019 Volkswagen Atlas in Cape May County, NJ shows what a modern SUV is capable of. Drivers have a wide selection of 2019 Atlas models to choose from, especially with the addition of two R-Line trims for the 2019 model year. Trim levels the 2019 Volkswagen Atlas is offered in include S, SE, SE w/ Technology, SE w/ Technology R-Line, SEL, SEL R-Line and SEL Premium. While 2019 Atlas S models come equipped with a turbocharged, four-cylinder engine with 235 horsepower and 258 pound-feet of torque, the SE trim and above comes with a 3.6-liter V6 engine with an output of 276 horsepower and 258 pound-feet of torque. While front-wheel drive is standard for every trim, all-wheel drive is available for the SE trim and above. There’s more to the 2019 Volkswagen Atlas experience than great performance, however. This SUV has an available 96.8 cubic feet of cargo space when the second and third rows of seating are folded down. The cabin’s spacious interior makes it more comfortable for passengers, too. The 2019 Atlas features 37.6 inches of leg room in its second row and 33.7 inches of leg room in its third row. 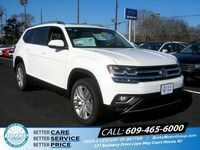 Available 2019 Volkswagen Atlas comfort and convenience features include: Interior ambient lighting, an auto-dimming rearview mirror, keyless access with push-button start, two 12-volt power outlets (one in the front, one in the rear), Volkswagen Digital Cockpit, adaptive cruise control, leather upholstery, an overhead-view parking camera, heated seating and a parking assistance system. 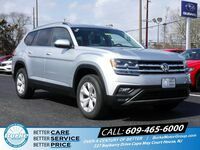 Interested in a 2019 Volkswagen Atlas?